ABOUT THIS INTERVIEW: On June 9th 1964, the Beatles performed two shows at the Princess Theatre in Kowloon Hong Kong. The next day on the 10th, the group and their entourage hopped a flight to Sydney Australia. Accompanying the Beatles on this plane trip was Australian disc jockey Bob Rogers, who would travel with them on the Australasian leg of the tour. Ringo Starr was resting in a London hospital after suffering a severe bout of tonsillitis. Temporarily sitting-in with the Beatles until Ringo was well enough to return was drummer Jimmy Nicol. 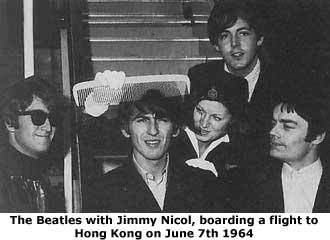 Bob Rogers took the opportunity in Hong Kong to record a chat with John and George, followed by a conversation with Paul, at Kaitak Airport on June 10th while awaiting their departure to Sydney. The Beatles discuss Hong Kong and all things Australian with Rogers as they look forward to their arrival down under. Q: "To 'Waltzing Matilda,' here are the Beatles." JOHN AND GEORGE: (jokingly out of tune) "'Waltzing Matilda. Waltzing Matilda. You'll come a-waltzing Matilda with me.'" Q: "Don't ask me what a jumbuck is. I don't know." GEORGE: "Oh well. We know what a Frank Ifield is, though, don't we?" Q: "Aye! And a Rolf Harris." GEORGE: (sings) "'Tie me kangaroo down sport.'" Q: "Well, in 24 hours overnight you've come from summer to winter. How do you think that's going to affect your health?" JOHN: "I don't think it'll affect it at all." GEORGE: "We're always just naturally unhealthy, so it doesn't matter." Q: "And you're gonna wear these Hong Kong suits that you've had made." JOHN: "George and I haven't had any made." GEORGE: "No, 'cuz we're saving up." Q: "We read about it in the papers." JOHN: "Ah well, you never believe what they write in the papers. Paul's had one. That's all. He's had two." GEORGE: "Yeah. Our road managers have had one or two." Q: "Now what are you gonna do while you're in Australia Are you going to be able to get out, or are you going to have to be locked in your rooms all the time?" GEORGE: "We don't really know 'til we get to wherever we're going." JOHN: "We don't expect to get out, anyway. If we do it's uhh... lucky, you know." GEORGE: "If we do it's a lucky." JOHN: "It's a lucky. That say me." Q: "You can't go on living in a prison like this all your lives?" JOHN: "Well, it won't last all our lives, will it." JOHN: "Well, don't ask me that. But we know it won't last all our lives. That's enough." Q: "Now Paul, you bought a Chinese suit." PAUL: "Yes that's true. Two, I got." Q: "How much did you pay for them?" PAUL: "It wasn't very dear. About ten quid, I think." Q: "I thought, being the Beatles, they'd charge you twice as much. Did you have a chance to barter with the man?" PAUL: "Yeah. Oh it was great, actually. 'Cuz somebody said you gotta haggle and get the prices down, so I did. It was quite good. Some little fella was selling some ornaments and he wanted 160 dollars for them. No. He was selling a watch. That's it... wanted 160 Hong Kong dollars for it. So I kept saying to him 'No, it's not right! Not right! Hundred dollars, that's right!' Anyway, I got him down to a hundred dollars. It was probably worth about thirty dollars, mind you." Q: "Do you want to buy anything in Australia?" PAUL: "Uhh, anything in particular... I dunno. I think everyone who goes to Australia buys a boomerang, don't they. I think I'll skip that one. It's a bit... I don't fancy it. There's not much chance to use it in London, really."